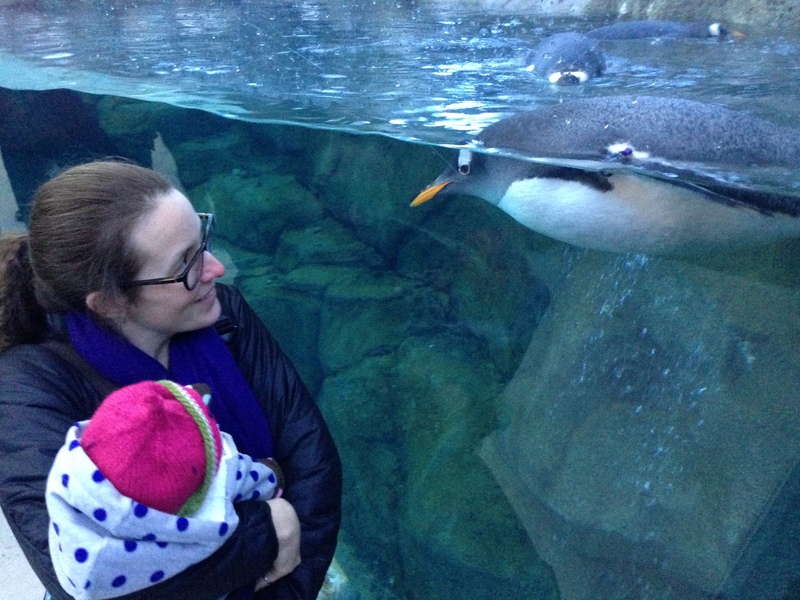 Diving headlong into motherhood this year has meant less blogging (obvious to anyone who subscribes here…), but it has also made me think a lot more about the scientific life that I would hope for my new daughter and girls like her. Currently her research interests include ceiling fans, her toes, her soother, the dogs and the penguins at the Calgary Zoo. But should she be interested in pursuing science as a career, what would I want her to know? Despite tremendous change in science over the past decades, making a scientific life is still difficult for many women. There are strong institutional and personal biases in place, chilly climates, difficult job structures and sometimes daily aggressions that women face. If my daughter were heading off to grad school (rather than daycare) in the near future, I would want her to know this up front but also know that women find many different ways to follow their scientific passions. Some do it by finding ways to succeed in the academic system and others make completely new career paths for themselves. Anthropologist Jessica Brinkworth and I are working on just the kind of book that I would want to give my daughter as she packed her bags to head off for her first fieldwork or her first position in a lab, a book of stories of what women have faced in their careers and how they’ve made a scientific life work, inside or outside of academia. We’re hoping to provide support, hope and the closest thing to mentoring that a book could offer. The full call for papers in below. If you have a story to share of how you live your scientific life, please consider sharing it with us or passing this on to anyone who might have something to share. Many young women dream of a life in science, inspired by the opportunity for a meaningful and rewarding career involving curiosity, passion, mentorship and discovery. Indeed, a desire to reap such rewards can help explain the representation of women in the early stages of some scientific careers (e.g. graduate enrollment), especially in biological and life sciences. Women are, however, very underrepresented in senior research positions. It is fair to say that the proportion of women employed at the senior research level does not nearly reflect the numbers of women who initially express interest in science career. The reasons behind women staying in science, progressing through the academic/corporate hierarchy or leaving science entirely are complex, but we likely can all point to pivotal moments and challenges that we faced over the course of our experience with the scientific lifestyle. For some of us, these are singular standout moments, for others it is the accumulation of small aggressions that wear us down. Whether it be low pay, long work hours, the pressures of publish or perish, loss of potential retirement fund years, new career interests, spousal career conflict, change in family arrangements or responsibilities, difficult job searches, bullying, harassment or exclusion, there are a myriad of reasons that women are not proportionally represented in science jobs. Those of us that have worked in science have, however, found one way or another to deal with these challenges and have something valuable to share with our peers and those who are coming up behind us. The aim of this book is to present the shared wisdom of women who have worked in science to girls and women contemplating or actively pursuing scientific careers. We are collecting personal essays describing the challenges, large and small, experienced by women over the course of education and career development and the strategies they developed to cope and move forward, including finding other avenues for their scientific passions. The overall goal is to provide a collection of relatable stories that can offer support and hope to those at all stages of pursuing a career in science. If you are interested in participating, please send an email with a provisional subject/title by September 10th, 2014 to Jessica Brinkworth and Marie-Claire Shanahan at jfbrinkworth@gmail.com and mcshanah@ucalgary.ca. Provisional abstracts (250-500 words) are due to us by September 30th, 2014. Essays will be approximately 1500-5000 words long and can include images if desired. The suggested topics below are a guideline only. We are willing to consider any essay that describes challenges and negative experiences and specific strategies and coping mechanisms that you used, even if it changed the direction of your work or life. We are sensitive to concerns about privacy and will work with authors to ensure that their stories can be conveyed fairly while preserving their personal and professional security. Please forward this call for essays to anyone you think might be interested in participating in such a project. We are seeking authors from a broad variety of fields and backgrounds. This entry was posted in Follies of the Human Condition and tagged academia, Feminism, parenting, science, tenure, women, women in science. Bookmark the permalink. Hi, are you including a career as an academic surgeon as “science”? I am a colorectal surgeon and spent two years doing lab research as a postgrad. I’m married and have 2 children. Yes, definitely! Send us an email, we’d love to hear your story. This is a wonderful call for the stories of women in science. Cool, thanks for sending that link. It looks like a terrific collection.